Opening the door, taking off the roof and you are ready for observing or photographing. 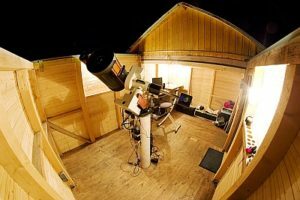 This gain of time is the reason for most amateur astronomers to build their own garden observatory. 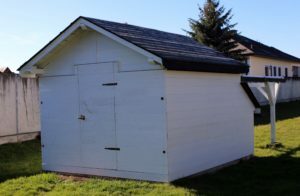 After several years of a setting up and removing my telescopes each observing night, my dreams came true: an own garden observatory with a run-off shed. Built in September 2007. This astro hut enabled a series of marvelous stargazing nights. Viktor and Christian realised their plan of a garden observatory in Wulkaprodersdorf. Christians father-in-law, Herr Steiger, built the whole observatory in his private factory, a classical run-off shed construction. The observatory is in operation since 2003.